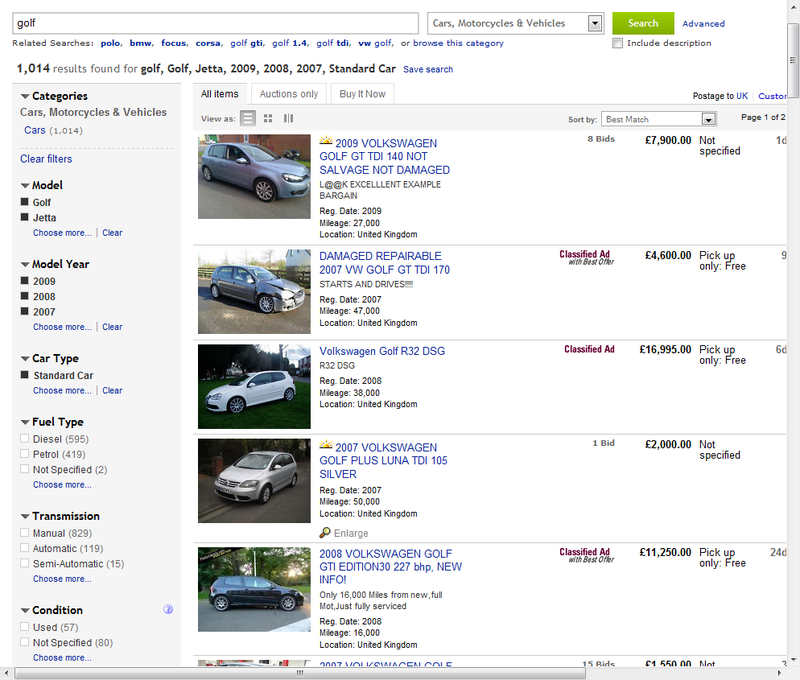 In our last post we looked at some of the fundamental issues in designing faceted search such as layout (e.g. where to place the faceted navigation menus) and state (e.g. whether they should be open or closed by default). In this post, we continue the mini-series with a review of the various formats for displaying facets and the key principles for choosing between them. Principle 1: Display only currently available facet values. By observing this principle, we provide a search experience that guides users toward meaningful navigational choices and avoids the possibility of zero results. (Note that there are exceptions to this such as the use of Smart Dead Ends, which we’ll discuss in a later post). Facets can be either single-select or multi-select. In the former case, the facet values are assumed to be mutually exclusive, i.e. only one may be applied at any given time. For example, a given copy of book may be assumed to have only one location: if it is in Library X, then by definition it cannot be simultaneously in Libraries Y or Z. This facet is therefore single-select. Conversely, some facets represent values which are *not* mutually exclusive, i.e. more than one may apply at any given time. For example, a given book may have more than one Author: if it is co-edited by Professor X, then it could also be simultaneously co-edited by Professors Y and Z. This facet is therefore multi-select. Multi-select facets can either be multi-select OR or multi-select AND. In the first case (OR), we assume that the values are combined disjunctively, e.g. a given book may have been published in either 2001, 2002 OR 2003. In the second case (AND), we assume that the values are combined conjunctively, e.g. a given book may have been co-authored by Professors X, Y AND Z. Multi-select AND tends to be somewhat rarer in faceted search, as it implies that selected facet values only make sense when applied in their totality. A typical example is purchasing a car: if the user specifies that they are looking for features A, B and C, the assumption is that they want ALL of these features to be present on EVERY record (e.g. air con AND sat nav AND sunroof), rather than just a subset of them (e.g. air con OR sat nav OR sunroof). Strictly speaking, if we accept the definition of facets as comprising mutually exclusive attributes, then a multi-select AND facet is actually a collection of individual Boolean facets that are grouped together for pragmatic reasons. By convention, values applied across different facets are normally applied conjunctively (e.g. Author A and Subject B and Date C) whereas values applied within a given facet are normally applied disjunctively (Date X or Date Y or Date Z). Facet values can be removed as well as applied. There are various ways to achieve this, but the principle is the same: the user deselects an applied value and the navigational context is updated accordingly. Facets can also enter a kind of ‘passive’ state indirectly. For example, the values applied in Facet A may result in the available values in Facet B being reduced to a singleton. In our library example, if we select books authored by Professor Smith, we may discover that the only applicable Date is 2002. Applying that single value would not change the navigational context as it applies equally to all records in the current result set. 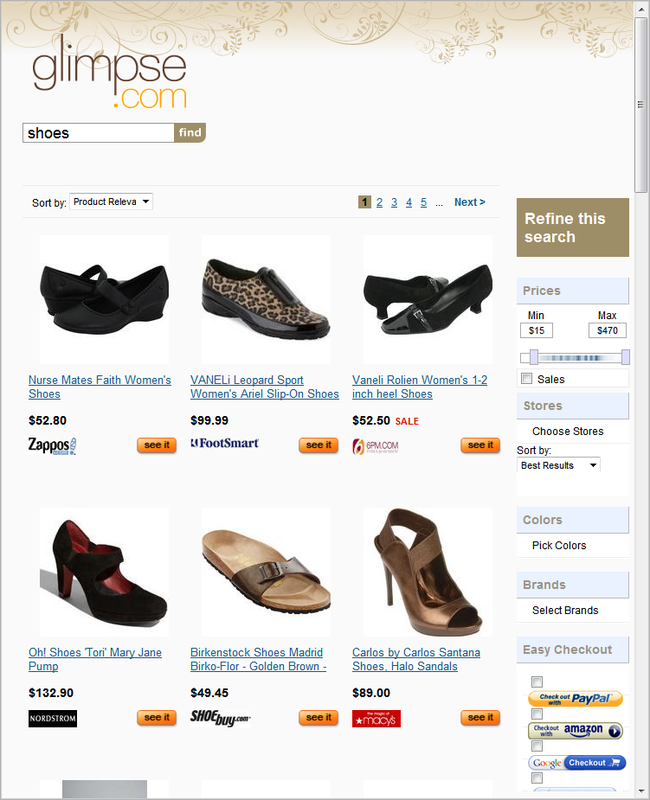 In some faceted search applications, facets in this state are also removed from display. Principle 2: Match the display format to the semantics of the facet values. Facets can be used to express a wide variety of data types, and consequently there is a wide variety of available display formats. In the following section, we examine some of the main options. Hyperlinks are probably the most common technique for representing facet values. They provide a simple and direct mechanism for representing textual values, and afford interaction through direct selection (e.g. via a mouse click). 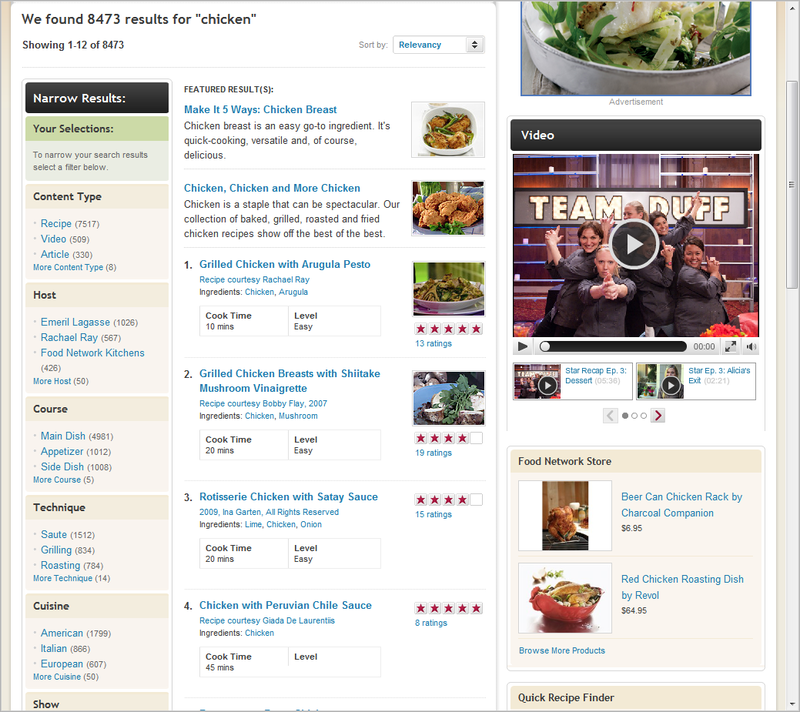 The example below from Food Network shows a typical faceted navigation menu, with the facets arranged in a vertical stack configuration. Each of the ten facets contains values that are essentially textual in nature, so as such are ideal for display using hyperlinks. One of the reasons for the popularity of hyperlinks is their simple interaction model: the user selects a value, and the system responds by applying that value as a refinement to the current navigational context. So in the example above, if the user selects Content Type=Recipe, the result set is updated to include only recipes (and the breadbox is updated to show this selection). Likewise, if the user selects Course=Main Dish, the results are updated to include only recipes for main dishes. This simple example also illustrates the one of the design behaviours mentioned above: single select facets are ‘refined away’ after being applied. For example, once a value for Content Type has been applied, the facet disappears. Likewise, once a value for Course has been selected, the facet disappears. The end result is that the faceted menu shrinks as further refinements are applied. Note that multi-select facets require a different behaviour: in this case, the assumption is that more than one value from each facet may be simultaneously applied, so the individual facets need to remain visible for further selections to be made by the user. 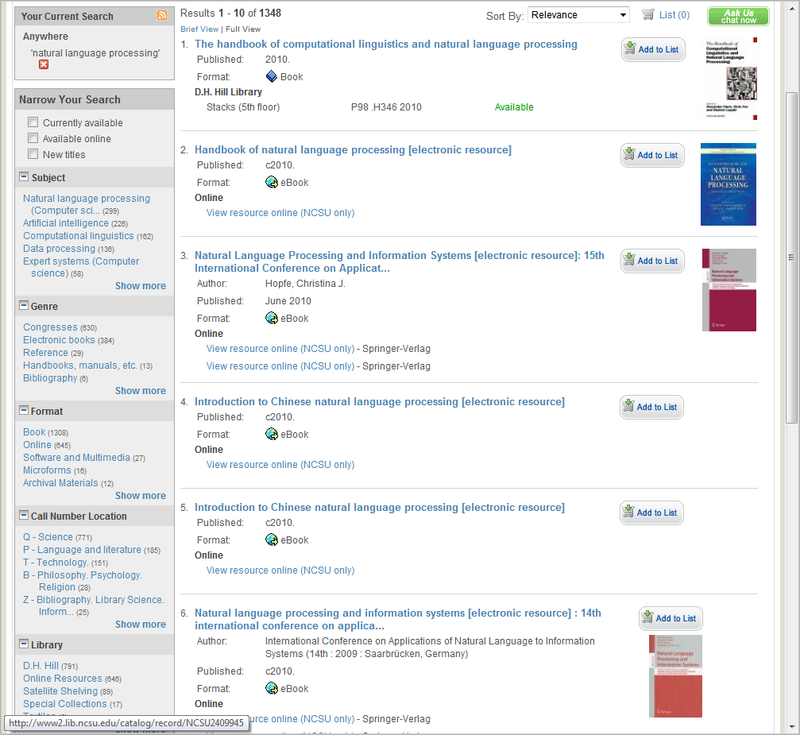 In this example, the user can select multiple Subjects, Genres, Formats, and so on, and these are added to the navigational context each time. But there are two reasons why hyperlinks are not the ideal display format for multi-select facets. First, there is the issue that they are by convention typically used to display single-select facet values, and offer a strong affordance of single-select behaviour. Secondly, there exists an alternative display mechanism that is specifically designed to support multiple selections from a number of options: the checkbox. Checkboxes support multiple selection and the communication of navigational state through inline breadcrumbs. In this example, the user can select multiple models (e.g. Golf OR Jetta) and multiple model years (2009 OR 2008 OR 2007) and these choices are displayed inline as selected checkboxes. A discussion of the negative consequences of using hyperlinks and checkboxes inappropriately can be found at UXMatters. However, this article itself conflates the issue of facet semantics (single-select vs. multi-select) with that of display mechanism (hyperlinks vs. checkboxes). Although there are dependencies between these two issues, they are in fact separate: the first reflects the conceptual data model, the second the desired user experience. A more informed design approach would recognize this distinction. 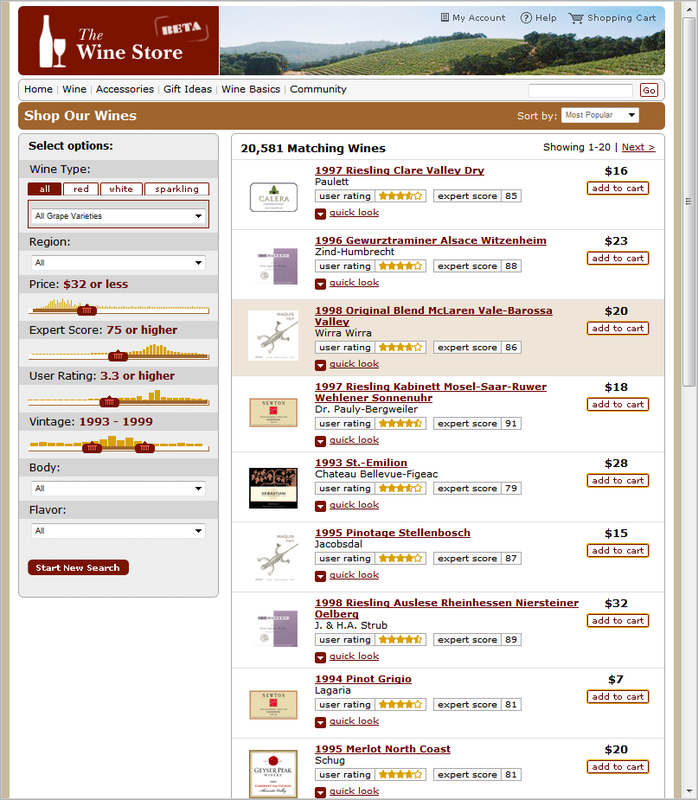 This example shows the use of sliders for quantitative data such as of Price, Expert Score, User Rating and for interval data such as Vintage. Note also that this example uses single ended sliders for the first three but double-ended for the latter. The rationale here is that most users would only be interested a maximum value for price, or a minimum value for Expert Score and User Rating. Conversely, they may be interested in both a start date and an end date for a particular range of vintages (using both a maximum and a minimum). This example also illustrates how the basic slider can be overlaid with supplementary information such as a histogram showing the distribution of record counts across the range. This helps the user understand the overall information space by providing them with a global view of the ‘landscape’ within each facet, guiding them toward more meaningful and productive selections. With a range as wide as $15 to $470, specifying a precise value much easier using the input boxes than using the slider. Note that the intervals need not be of equal size: in Amazon’s case, they divide the overall range into five ‘bins’ of differing size, in what may be a strategy to smooth the distribution of record counts within each range (we’ll discuss the issue of displaying bin counts in a later post). Alternatively, this may simply be a reflection of the price points found to be uppermost in shopper’s minds when they browse these particular products. Although the user has great flexibility in selecting a precise colour value, the corollary is that it is easy for the user to select an illegal value (i.e. one which is not available within the current result set). In this respect, this approach violates Principle 1 above. 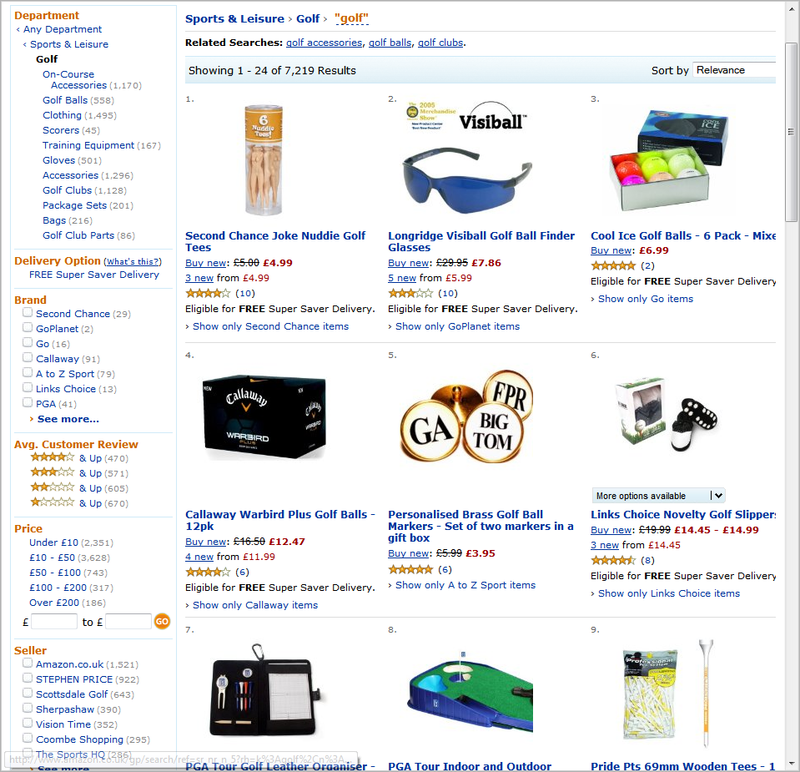 An alternative to the colour picker is to simply use text labels for each value, and this approach is surprisingly common (being widely used by both Amazon and eBay). The challenge is, of course, to select textual labels that are going to be meaningful to the end user and also faithfully represent the appearance of the item itself. Inevitably, once the range extends beyond basic primary and secondary colours, such mappings start to become increasingly tenuous. A decade or so ago, there was no such thing as a tag cloud – at least, not outside of a few research labs and data visualization projects. Then along came Flickr, Delicious and a host of other online community sites with vast repositories of user-generated and user-tagged content. 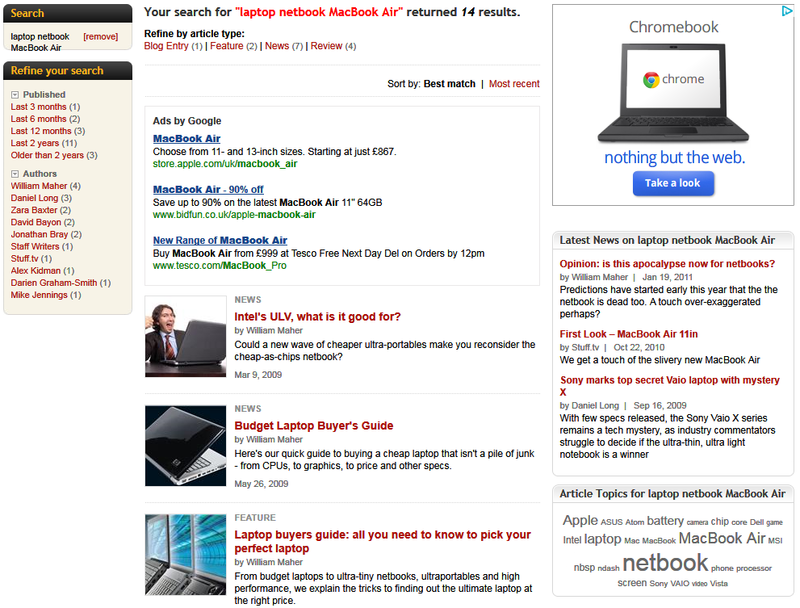 Tag clouds, with their ability to represent measures such as tag frequency and popularity in a visually appealing manner, rapidly became the standard technique for displaying and exploring such content. Soon, their use was extended to include unstructured content, displaying clouds of terms extracted from text documents. Unlike Artist Rising, the tag cloud in this implementation supports multiple refinements, updating its own contents on each iteration. In each of the above examples the records have been considered as unique entities, i.e. 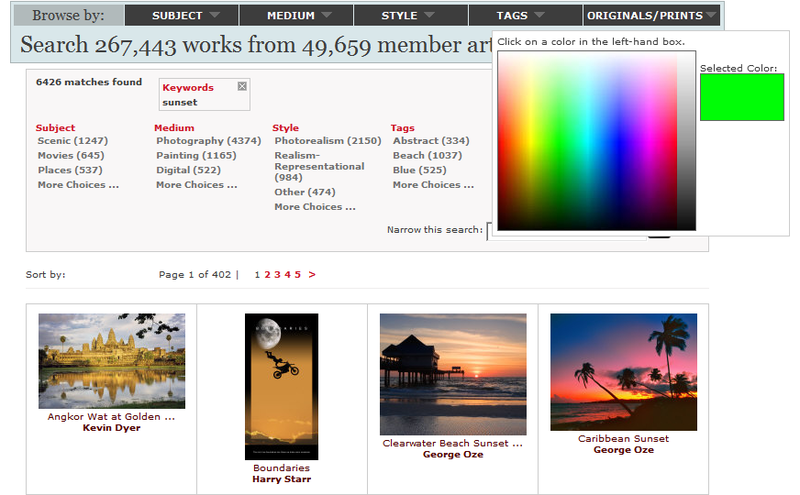 the goal of the search experience is locating and then viewing one or more individual records. In this context, the role of the facet values is primarily to facilitate that process; to smooth the journey from initial query to product record. But an increasing number of applications are concerned with understanding patterns inherent in the collection at a much higher level, where the focus is not on locating individual records but on understanding patterns of distribution and occurrence at an aggregate level. In these applications, the facets play a much more central role in the discovery experience, with the focus shifting from findablity to broader tasks such as analysis, sensemaking and discovery-oriented problem solving. 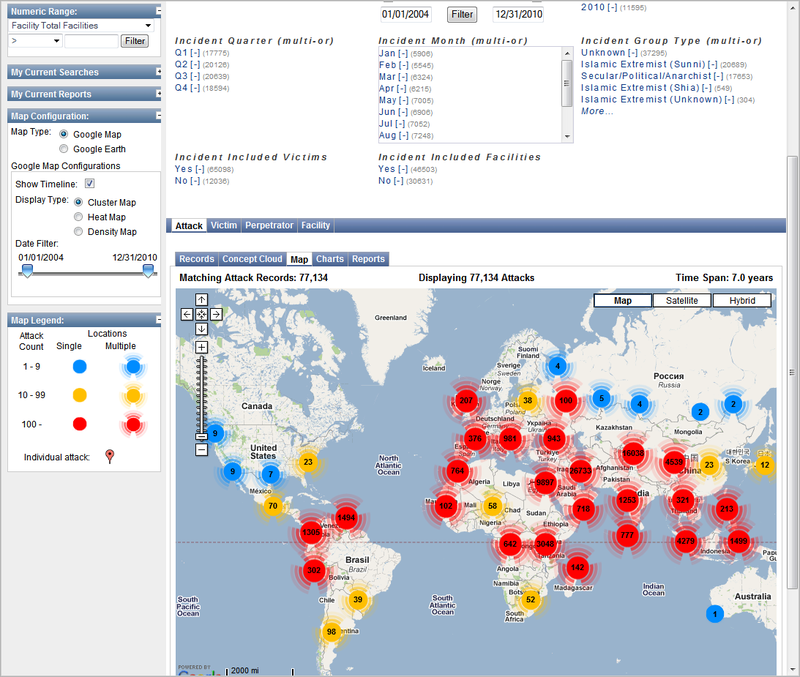 Visualizations such as this allow users to perceive spatial patterns in record distribution and explore relationships between particular facets (rendered as hyperlinks in the upper panel) and aggregate distributions across the map. However, the interaction model in this implementation is somewhat different to Newssift, in that selecting an item on the map (e.g. a cluster in the rendering above) appears to centre and zoom the map on that region, rather than applying the selected item as a refinement. In this respect, the visualization is not behaving as a facet in the strict sense, but it nonetheless allows the end user to productively explore patterns at the aggregate record level. Over the last few weeks we’ve looked at some of fundamental design issues in faceted search, such as layout (e.g. where to place the faceted navigation menus) and state (e.g. whether they should be open or closed by default). In this article, we’ve complemented that with a review of the many formats for displaying facets and the key principles for choosing between them. In our next post, we’ll round out this mini-series with a look some of the remaining design fundamentals including display scalability (i.e. techniques for managing long lists of facet values).